In 1863, Mr. and Mrs. Luther Gulick started a boarding school for girls in Kaʻū. This was continued at Waiohinu for two years, but was moved to Oʻahu. The Gulicks' school was established "to teach the principles of Christianity, domestic science, and the ways and usages of western civilization." Mrs. Gulick's school was the humble beginning of Kawaiahaʻo Seminary. From month-to-month the numbers increased, boarders were received and aid in teaching was rendered by neighbors. The school continued to grow, when, in 1867, the need for permanent help became imperative and Miss Lydia Bingham (daughter of Hiram Bingham - and my great-great-great Aunt) was invited to become its Principal. Lydia Bingham left the school in 1873 when she married Reverend Titus Coan of Hilo. She was followed by her sister, Miss Lizzie Bingham, who was principal for nearly seven years. Damon (fluent in Chinese) recognized the need for special educational opportunities for the young Chinese, who were barred from public schools because of their inability to speak English. Later, because of growing enrollment by Japanese and Korean boys, courses in Japanese and Korean were added to the curriculum. Kawaiahaʻo Seminary and Mills School had much in common - they were home schools; founded by missionary couples; and had boarding of students. With these commonalities, in 1905, a merger of the two was suggested, forming a co-educational institution in the same facility. 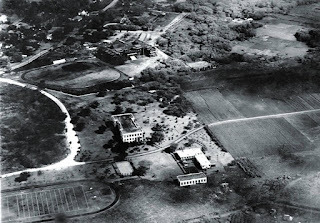 In order to accommodate a combined school, the Hawaiian Board of Foreign Missions purchased the Kidwell estate, about 35-acres of land in Mānoa valley. By 1908, the first building was completed and the school was officially operated as Mid-Pacific Institute, consisting of Kawaiahaʻo School for Girls and Damon School for Boys. Initially, while the two schools moved to the same campus, they essentially went their separate ways there for years; they had different curricula, different academic standards and different policies. Finally, in the fall of 1922, a new coeducational plan went into effect - likewise, 'Mills' and 'Kawaiahaʻo' were dropped and by June 1923, Mid-Pacific became the common, shared name. In November 2003, the school decided to terminate its on-campus dormitory (which had existed since 1908). Epiphany School, established in 1937 as a small mission school by the Episcopal Church of the Epiphany, merged with Mid-Pacific Institute in 2004. Mid-Pacific introduced a one-to-one all-school technology program designed to foster creativity, global awareness, critical thinking and collaboration. The image shows the existing Mid-Pacific Institute overlooking the beginning of the University of Hawaiʻi-Mānoa campus in 1912. In addition, I have added other related images in a folder of like name in the Photos section on my Facebook and Google+ pages.